As birth photographers, we give a lot to our clients because we LOVE our jobs. We spend weeks on call for each client, taking our phones everywhere and knowing we can be called away at any moment. We spend hours at births, sometimes leaving or missing family events, holidays and more to be there for our birth clients. We do it, because we love it. And we truly love the clients we work with. I wanted to share a few quotes of gratitude from myself and some birth photographers from around the world. I want you to know, as a client, how much you really mean to us. Angie Klaus says about birth: "2016 was my first full year as a birth photographer, and I couldn't be more grateful for the opportunity to serve my birth clients. While the on-call lifestyle is challenging, there is nothing like witnessing a mother's incredible strength to bring new life into the world, a partner's relentless support, the tender care of dedicated birth teams, and every moment a new baby opens her eyes for the very first time. Each birth is stored in my heart and each story I document is carried with me. " Elliana Gilbert says it so well, "It is hard to explain to a potential client what to make of a "birth photographer." So I like to use an analogy. Imagine that I am a passionate gardener/landscaper and that your birth space is a garden. When I walk into your garden, regardless of whether it's a hospital room, a messy livingroom in a home, a birth centre, heck - even your vehicle if that's where birth happens for you... what I see is: potential! I see you, the labouring and birthing person as the centre and focus of this garden, the thing that is to be most celebrated, most accentuated, most nourished, respected and supported in the entire garden. You are front and centre. I see all the other plants in your garden that help prop you up, support you and help you be at your best (your partner, doula, caregiver, family, pets - and even the inanimate things that adorn your space from which you draw strength and inspiration) and I nurture and highlight them as I work my way through your garden. I also see the weeds of a birth space and I carefully remove them, or cast them in shadow tastefully, like the everyday visual noise that could be seen as unsightly, like chipped and crackled walls in a hospital room, outdated furniture you're not proud of, or just the everyday madness that exists in a home, which you might not really want to notice when you're busy labouring and birthing. "A new mother prepares to breastfeed her baby for the very first time. This single image, of this exact moment in time, is one of the many reasons that I love birth photography. Had it not been captured this moment would have passed by without much thought at all. " This beautiful girl was born covered in vernix. Vernix is a sticky waxy substance full of protective elements for baby - left on it will soak in in about 24 hours. "The moments following birth can be filled with ecstasy, euphoria and much love, but also, tiredness, relief, even trauma in some cases. How women perceive themselves and their immediate postbirth body is so important, and media often tells us that we need to switch gears and work on changing ourselves back to the women we were before pregnancy. How about we encourage one another to celebrate the miracle of birth, the incredible ability to create and inoculate life within the womb, and give our bodies the grace they deserve after such a monumental feat of childbirth. This man honours his partner's postpartum belly, and she radiates love and strength, with his support. I hope this portrait inspires all partners out there to honour the birth process, not just up until baby is born, but also the postpartum stage." "The most amazing part about documenting births is being able to capture the true rawness and beauty of birth as it unfolds." "This mama had a beautiful VBAC on the supermoon!" "This particular image for me is the best work I have produced in 2016. It is a beautiful decisive moment captured in a photograph for all time. It is a record of pure joy and the beginning of a journey to motherhood. When I view this image it fills me with a deep emotion and touches the very core of me as a birth photographer. It's confirmation that documenting a birth is such an incredible genre of photography, and one I will continue to do for years and years." Mama delivered her first set of twins just 20 months ago and after an attempted VBAC she met her second set of twins through belly birth. It was an honor to capture their birth day!" "It's a boy!! The whole family is overwhelmed with emotion as they welcome baby brother at home surrounded by loving family." " I love the tenderness in the photo. The flurry of the birth is over – here a new path is unfolding, the birth of the mother-child relationship has begun. " "This image is one of my favourites of 2016 because of the strong feminine energy and sisterhood that was in the room that night: the birthing mum, with her doula, midwife, nurses, and me...(and hubby on skype). So much girl power!!" "One of my favorite parts of being invited into someones birthing space is to see all the strength and emotion within a woman." "Surrounded by her tribe, she pushes through the pain to birth her 6th baby, the first at home." "Through strength and determination this momma achieved her daughter's birth the way she dreamed. Renting an Air B'n'B, her husband drove almost 3 hours with her labouring in the back of the family minivan on all fours, in order to deliver her baby with the help of a midwifery team comfortable with an HBAC (Home birth after C-section) Rose Jora was born in the water, caught by her Daddy on a rainy fall day." "This is a home birth in Belgium. I'm from the Netherlands, where birthing at home is normal. Belgium is totally different. She had her 4th baby at home (first 3 were in the hospital) with everybody (children, mother, mother-in-law, dad) present. It was amazing and big sister could not believe her eyes when baby came out! Nothing but love for this family!" "This was my first birth photography experience and I wasn't sure what to expect of the c section, but we were all elated to see that dad got to cut the cord right there on the table. What an amazing experience for all of us involved. I love it when barriers are let down (quite literally in this case) and family is allowed to be involved so wholly in the birthing process - especially during a c section that can often be such an isolating and disengaged process." When you fall in love all over again. Reaching for Mommy after a lightning fast delivery. "I love this image because of the moment it captures. 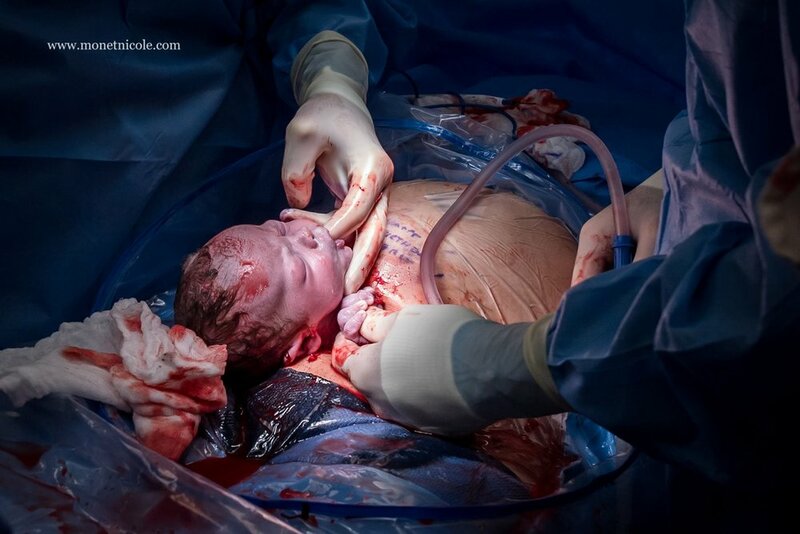 The cutting of the cord is the very last moment that mother and baby will be connected SO intimately, and the time AND date was recorded on the midwives watch. Gives me goosebumps." "The anticipation and relief of the first cry. " "The magical moment their two hearts met and beat together for the very first time. Skin to skin with big brother at just a few hours new. Birth can be a family event where older siblings are a part of the experience and what a life gift they are given to have birth normalized for them forever." "This birth was such an amazing experience for me as a birth worker. The mother was a midwife and a good friend of mine. She conceived her baby via IVF after adopting embryos. After a rollercoaster of a labor, she finally began to push, and as baby emerged we realized she was not only completely OP (she has turned by the time I took this photo) but she was asynclitic - as evidenced by the super lopsided pointy little head. Of course her little noggin rounded out perfectly within a few hours, but I just find it so fascinating what our bodies and our baby's bodies are capable of during birth." "Birth is so unpredictable, but the sweet sounds of a new crying baby always seem to bring a smile to everyone's face no matter what the struggles may have been. his first time mama tried so very hard to get her home water birth. After her transfer, she patiently waited to meet her sweet baby girl. That moment finally arrives and the entire room lit up with joy at the sight of this baby girl finally being earth side"
"This mama had what the midwives jokingly called a "shy uterus". We all were called to her house on Friday morning around 2am, when her contractions were strong and steady. As the night went on, her labor sadly stalled, so we all went home around 11am to let her rest and go see her Chiropractor. Afraid they would stall her labor again, they waited to call everyone back until they knew things were a sure thing. Around 2am on Saturday morning I received the call that her water had broke. I had about a 45 minute drive, which they knew about, and when I arrived, her cousin-in-law opened the door with "she's here!". I was so sad that I missed her birth, but they told me that she only pushed for 15 minutes after her water broke before baby made her debut. Pretty impressive for a first time mom! I love this image of daddy holding moms hand, mom kissing babe's sweet head with the plastic covering the couch. There was so much love in the room. We (me plus her birth team) all just sat in awe. " "I love this image so much because mom was so close, baby was born less than 3 minutes later. I love so much that dad jumped in the water to support her." "The photo I have submitted is from my first home birth and mom's first daughter after 3 boys! The look on their faces says it all!" "Skin-to-skin" The moment your baby is placed on you, healing begins for both mom and baby. Memories of pain, struggle, and fear melt away and are quickly replace with hormone-laced feelings of elation, pride, and over-whelming love. This moment marks a transition from connection between mama and baby to true bonding. "This image different and foreign to our beliefs and the way we are custom to doing things, yet still incredibly beautiful. The women all formed a sacred bond and surrounded the laboring mother with love and care. " 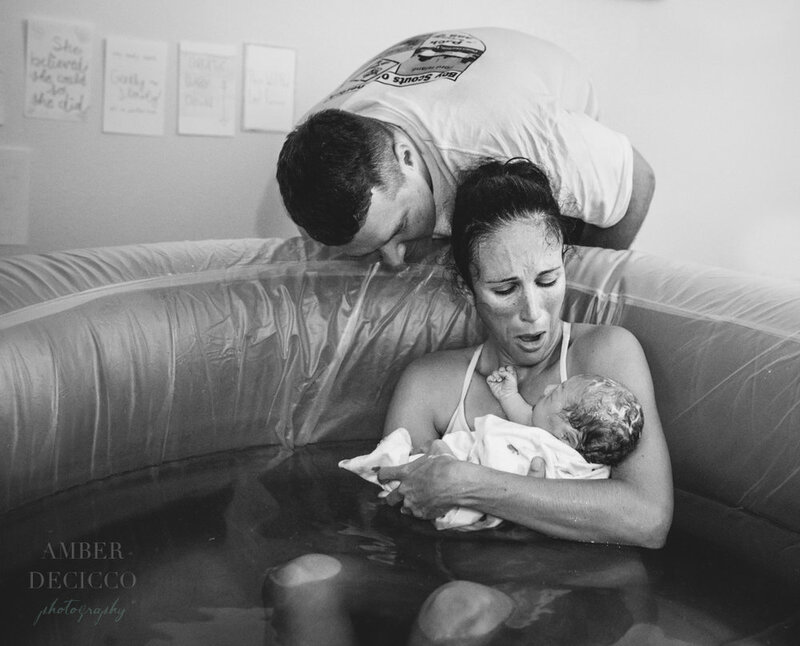 "This moment, between a mother and her new baby, truly reflects the calm, intimate connection they are experiencing... and when I look at this picture, I can almost feel it. I can feel the serenity. It's very soothing to see the peaceful, perfect love that they share." "This Mama is an ER nurse. She is insanely tough. She labored all night by herself and called me when she was a 9cm. She “stalled” and labored for 9 more hours until her son came earth side." "It is not unheard of for hospital staff to ask the doula, photographer, or even Dad to step out of the room for an epidural procedure. I felt it was a special and rare opportunity to capture this part of their birth story - a common and important part of many mother's stories that often isn't seen through photos! The light was just right and she is so beautiful and calm while her anesthesiologist is prepping in the background." "I love everything about this image. Just moments after birth, I love seeing the mother’s expressions with the fresh new baby in her arms and dad looking over her shoulder to get his first glimpse at first baby girl!" "I cannot even begin to describe how empowering this birth was. With dad right by moms side the entire labor he welcomed his daughter into the world by catching and being the first person she ever touched and laid eyes on. These are the moments the world needs to see. " "This mom literally breathed her baby out and this was one of the most calm and peaceful births I have witnessed as a doula and birth photographer. I was standing in the corner on top of the birthing tub and her mom was on speaker phone listening while she gave birth." "This birth was amazing to witness! This mother labored with a smile on her face and delivered her baby all natural at a local birth center. So inspirational for me on so many levels, as I birthed both my children in a hospital. I was uneducated, disconnected and unaware of my options. I think thats why I'm so drawn to the birthing world. To see how wonderful birth can be if we treat it as a experience not a procedure!" "Vernix is a white, cheesy substance that covers and protects baby's skin while in the womb. This little guy was born with the most I've ever seen! Amazing!" "This baby started sucking on the surgeon's hand as she emerged into the world." This little guy came out with his eyes wide open and he was looking right at his parents, as if to say, "there you are, I've been waiting for you!" He's now 8 months and still as wide eyed and curious as he was in this moment. In the throes of active labor, this kiss is all that she needs to calm her breath and fill her heart.